This week Aaron returned from Dallas, and we went straight to the beach, it’s really my happy place. 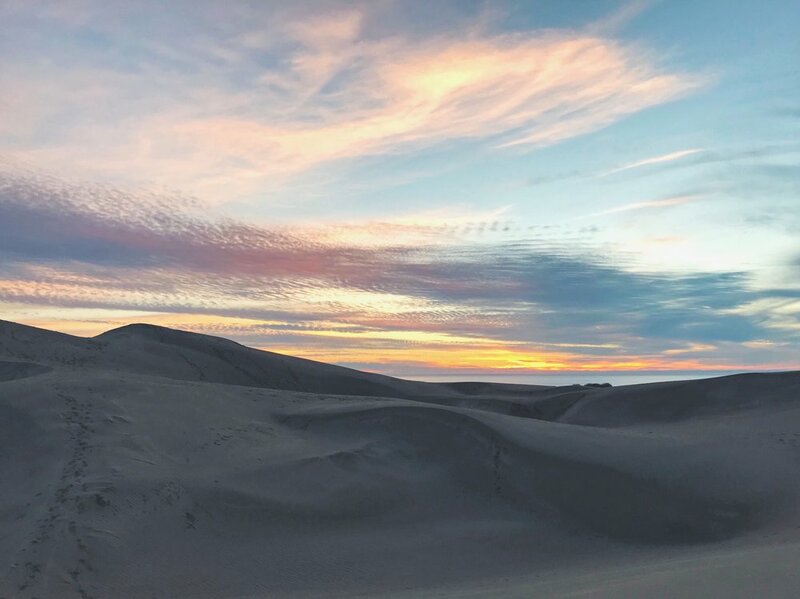 This time we went to Pismo Beach and stayed right next to the sand dunes. This is another one of those places I had been wanting to come stay at. It has been super windy while we’ve been here, and it even rained all day yesterday, but that didn’t keep up from enjoying this place. The kids, big and small, have loved sledding down the dunes! The first day we were here, once the kids were playing in the dunes, I decided to go for a walk to the beach… I was told it was about a mile of dunes before getting to the beach, so no big deal! I enjoyed every bit of the walk. Not gonna lie, climbing up some of those dunes is a bit of a workout, but you just can’t help and wonder what’s on the other side. I made it to the beach and sat and listened to the waves… I’m telling you, my happy place! I had tried to leave a clear line of tracks, because once you get past one of those big dunes you can no longer look back and see where you came from… it’s all sand! Well, I didn’t take into account that the wind would dissolve my tracks. After 3 miles of wondering through the dunes, I finally got to a spot where I could see our campground, not without the help of my phone's GPS. It’s these type of experiences that I love about this lifestyle. The sunsets though, they've got to be the best!